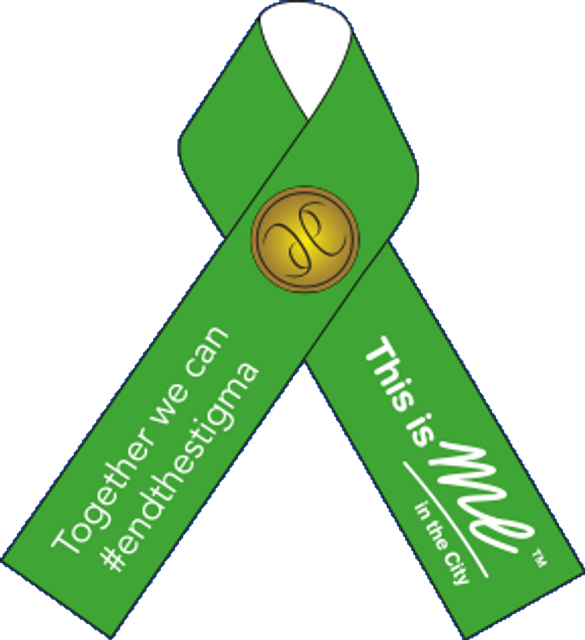 Last year in Mental Health Awareness Week in May the Lord Mayor's This is Me in the City campaign distributed 70,000 green ribbons across 160 organisations to people who wanted to demonstrate their support for better mental health awareness and to break the stigma around mental illness. Alongside all those lapels, 10 iconic London buildings were lit up in green for the week. Ribbons were worn across London, but also further afield, reaching various different continents as well as countries. This year we are doing it again but it will be bigger and better! Along with the ribbons there are very tasteful pin badges, and the hope is get more buildings going green. Now is the time for organisations to order their materials so that they are ready in time for May. It is a really easy but hugely effective way for the city and those beyond to demonstrate visibly their support for the campaign. Just wearing a ribbon means we are breaking the stigma - it sends a message to those experiencing problems that they are supported and to everyone else it says this is something we are comfortable talking about. If you want to get involved then visit the campaign website here and place your order. If you don't, you may regret it come May when the rest of London turns green! Whose day is it today?